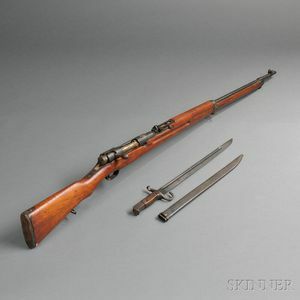 Japanese Arisaka Rifle and Bayonet, c. early to mid 20th century, serial number 97560, walnut stock, blued-steel parts, with characters on receiver and partially defaced chrysanthemum, overall lg. 50 1/4 in. Stock has a few dings and nicks, chrysanthemum partially removed, steel parts have some scattered light rust parts.